I love looking through old recipe files. When I am looking for inspiration those old clippings can be a treasure trove of great ideas tailored specifically to my own tastes and preferences and sometimes imbued with fond memories. Recently I was drawn to a few pages from my oldest collection of recipe clippings. These are taped onto notebook paper and held together by a torn black binder. The tape has yellowed and loosened and some of the pages fall out when it is opened. Inside there are some awesome recipes. Several pages consist of full menus torn from old issues of Southern Living dating back to the early 80's. When I was newly married and learning how to cook I loved the menus they published for simple entertaining. The recipes were reliable and the pairings inspired. While some dishes required a number of steps many of those steps could be done ahead of time and other recipes on the menu were often quite simple to prepare and offered a sense of balance. I confidently served these menus to friends for foyer group dinners and neighborhood gatherings. 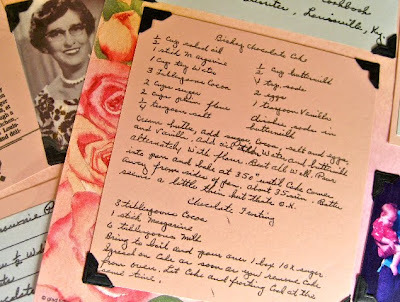 Looking back at a favorite recipe from those menus, I glance over the yellowing photograph on the page and smile. The memories are good and it has been a long time since I made Buttermilk-Pecan Chicken or Lemon Rice for a gathering of friends. I think it's time to get requainted. 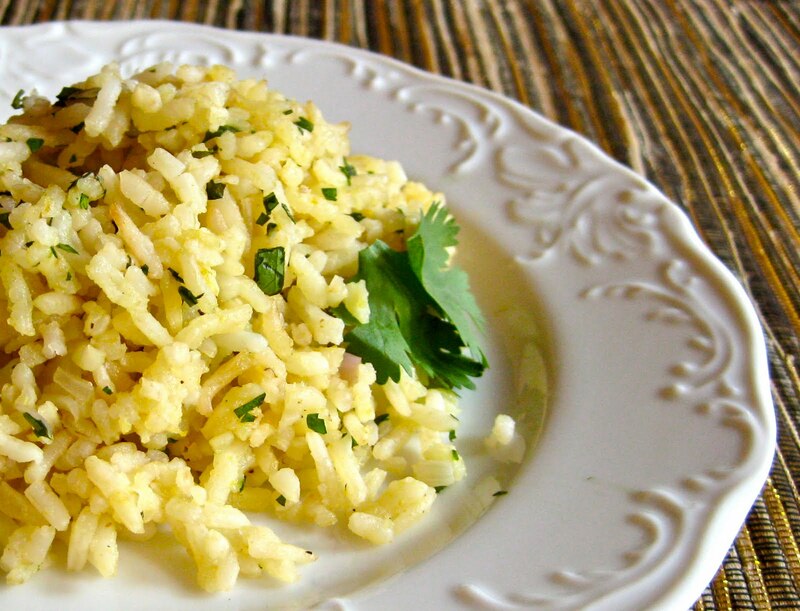 Lemon Rice makes a great summery side dish for many different entrees. 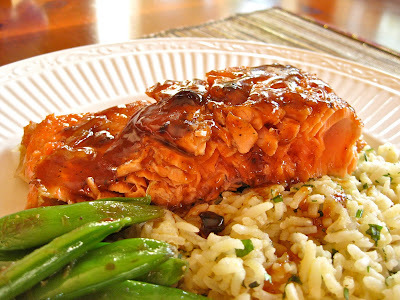 It goes great with baked chicken but it is also a tempting accompaniment to salmon or pork. Last week I paired it with Pan-Seared Salmon in Chipotle Honey-Lime Bourbon Glaze and remembered why I enjoy Southern Living, in so many ways. Of course this time around I couldn't resist changing a few things. I substituted vegetable broth for chicken bouillion cubes and water as well as cilantro for parsley. I used red onion for a bit of color and would have tossed in some toasted pine nuts when I fluffed the rice except that I had run out of pine nuts and didn't want to make a special trip to the market. I also read up on rice pilafs and used the technique suggested at Simply Recipes. That involved a few extra steps but I think it was worth it. The outcome was both pretty and delicious. Place the stock in a large saucepan with a close fitting lid. (I use my 4 quart farberware pot.) Add the lemon juice. Bring to a simmer. While the stock is warming heat the olive oil in a large skillet. Add the onion and garlic and sauté over medium-high heat until soft. Add the long grain rice to the skillet and continue to stir and cook until the mixture begins to brown slightly. Remove from heat. When the broth has come to a simmer carefully add the rice mixture to the broth. Bring the mixture back to a simmer, cover and reduce heat to low. Cook for 20 minutes or as long as the package of rice suggests. When done the rice should be tender and the liquid absorbed. Let the pilaf rest in the pan, covered, until ready to serve. 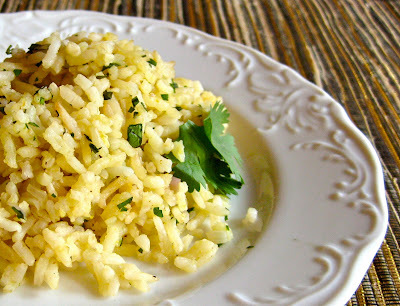 Fluff the rice with a fork before serving. Stir in toasted pine nuts if desired. I have been looking back at some of my earliest posts. 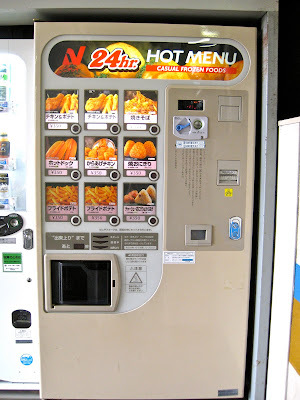 In the fall of 2007 I was writing about some of my favorite things; breakfasts in Japan and vending machines. Oddly enough, this summer I find myself coming full circle in blog topics. A few weeks ago I had another opportunity to travel to Japan. Again, I enjoyed some wonderful breakfasts, snacks and traditional meals. I was also on the lookout for interesting vending machines. I drank my share of Japanese unsweetened tea, canned coffee and juice from vending machines. I also saw, beer, whiskey, cigarettes and ice cream offered from machines in a variety of locations. I even noticed a machine that dispenses hot ramen noodles outside Kinkakuji, or the Golden Pavillion, in Kyoto. The most interesting machine, however, was at the Kyoto train station. in a corner of the train platform, beside the cigarettes and bottled drinks, was a vending machine that offered hot French Fries and other hot entrees. I was charmed by this discovery. Remembering my family's experience in Melk and the crispy hot French Fries that came from the vending machine there, I insisted we stop and buy some. We dug up the 350 yen, fed them into the machine and waited. Within a few minutes the process was complete. I reached into the pull out area to grab my box of hot French Fries. The box looked interesting enough. Carefully we opened it. Inside the fries were golden but certainly not crispy. In fact they were almost soggy. This machine, it seems, microwaves frozen packages of fried food rather than actually dropping it into hot oil like the vending machine in Melk. Oh well. Live and learn. Not all French Fry vending machines are created equal. We ditched the fries and headed for the Shinkansen. Along the way we picked up drinks and a two tiered bento box to explore on the train. In Kyoto Station's Shinkansen boarding area travelers do not suffer for lack of choices in Japanese style fast food. Why is it that tiny versions of everyday items make us smile? I have written about the charms of miniatures before but they never fail to take me by surprise. Last week at the Camas Farmer’s Market I saw that Reister Farms had quail eggs for sale. At least they had them very early in the afternoon, before I arrived. 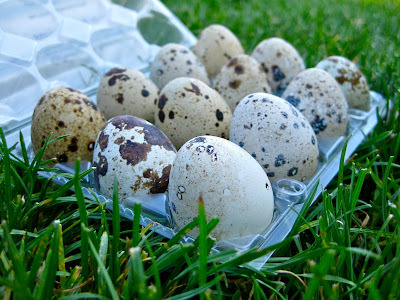 When I saw the words “Quail Eggs” crossed through and “Sold Out” written to the side I think I took it personally. I have had those quail eggs on my mind all week. 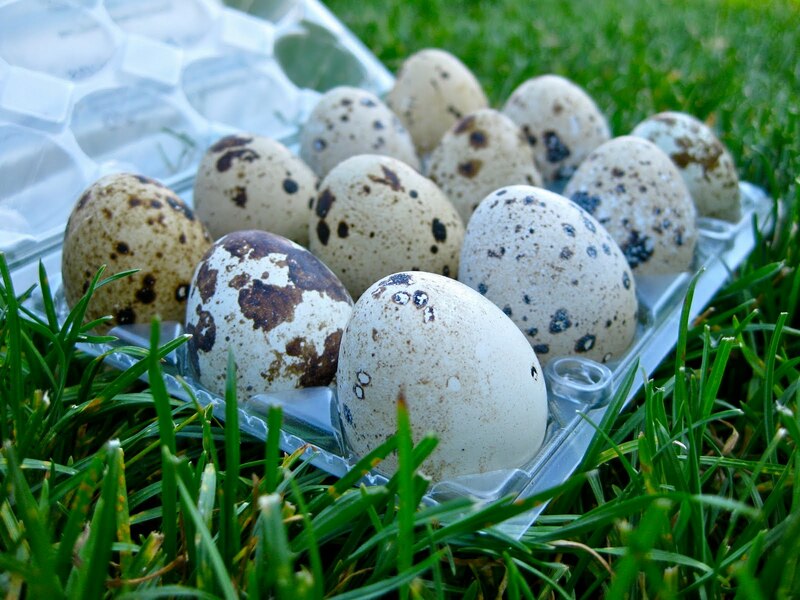 Though I know next to nothing about quail eggs I remember seeing a post about them, a picture that was stuck in my mind highlighting the extreme cuteness of these diminutive treasures. I sat down in the grass beside the Camas Library to admire my purchases. Friends joined me. 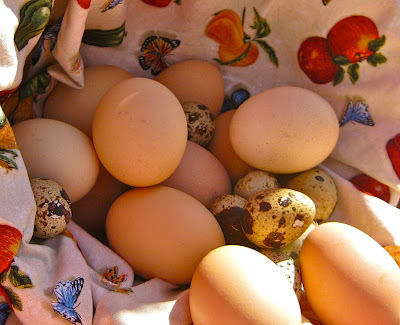 They helped me think of things to do with the eggs. I had to admit I was as eager to photograph them as I was to taste them. A few weeks ago I was in Kentucky enjoying a long awaited family vacation. Kentucky was full of sunshine and the sounds and smells of summer lodged deep in my childhood memories. 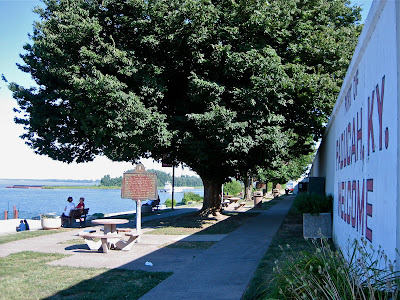 I basked in the warm night air listening to music along the river, watching fireworks over the river, eating ice cream and trying to catch the melting drips with my tongue before they spilled onto my hand and arm. It was bliss. While in Kentucky I also enjoyed the sunny attitude of the people there. It seemed that everywhere we went we were greeted with smiles, with interest, with the energy of thoughtful intentions. Maybe it is southern hospitality. Maybe it is living in the sunshine (something I dream of as I wait for the forecasted “morning clouds” to burn off here, even though it is well past 3pm this July afternoon). Or maybe it is simply my giddy joy in feeling genuinely at home somewhere even though that somewhere is several decades and a few thousand miles away most of the time. While that Kentucky summer sunshine seems far away at the moment I have a new cookbook to review that conjures up fond memories of my home state in no time. It is called The Kentucky Bourbon Cookbook. 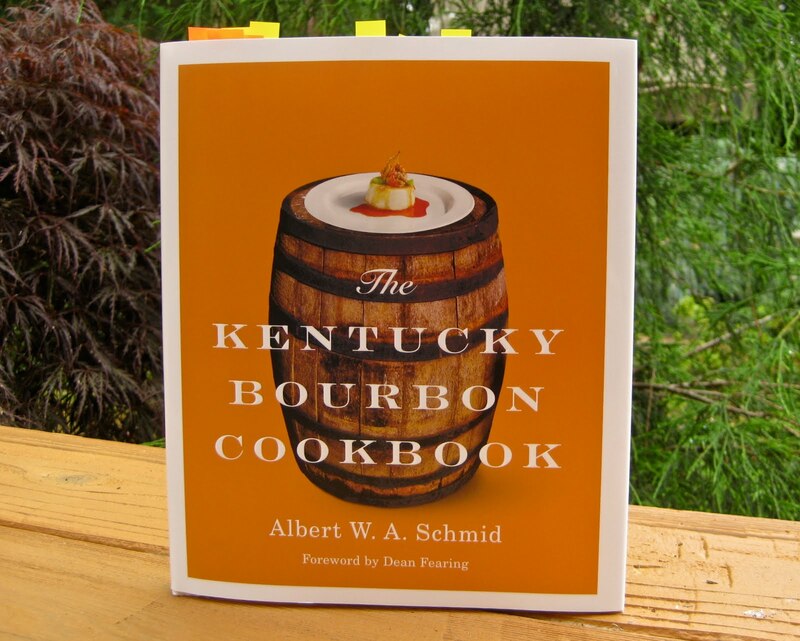 The author, Albert W. A. Schmid, who has worked as an executive chef, is now teaching at Sullivan University's National Center for Hospitality Studies in Louisville, KY. 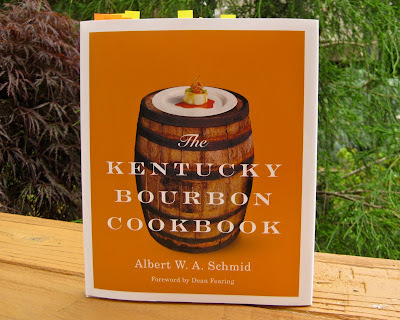 The book contains an impressive collection of recipes, many from famous chefs and food personalities and many using not only bourbon but other regional ingredients as well. This cookbook is relatively small in size and while it does contain full-page color pictures they are gathered into a center section of the book rather than being printed beside the recipes they feature. As a food blogger I found that format a bit challenging as I am used to seeing what a dish looks like as I read about how to prepare it. On the other hand the recipes are easy to find and follow as they are arranged, for the most part, one to a page. Each is accompanied by some explanation of the origin of the recipe and sometimes a word of advice or other recommendation is given. I liked that the recipes were arranged by season with a separate chapter dedicated to beverages. There was also a good bit of useful reference information added in a glossary, notes, a list of bourbon distilleries, several indexes and a bibliography in the back. Eager to be reminded of my recent visit to the region and those delightful warm evenings I dug right into the summer chapter. Intrigued by the introductions I read through recipe after recipe. They were inventive and inspiring and soon I found the book adorned with a host of brightly colored sticky notes. I stuck one marker on a recipe for Sweet Vidalia Kentucky Bourbon Sauté noting that I should try it with the Walla Walla Sweet Onions that I can easily obtain locally. I also marked Kentucky Bourbon Baked Beans for anticipated late summer barbecues and Steak with Bourbon-Ginger Sauce, a unique take on marinated grilled flank steak borrowed from another favorite book of mine: Around the Southern Table by Sarah Belk. There were even recipes for a Bourbon Apple Pie and a Kentucky Bourbon Banana Flambé and that was just in the "Summer" section. Backing up to "Spring" I found a recipe for Candied Kentucky Bourbon-Bacon Bites and I had to smile. This cookbook is loaded with interesting recipes but I needed to narrow down the choices and put something on for dinner. I decided on the recipe for Pan-Seared Salmon with Chipotle Honey-Lime Bourbon Glaze. It sounded like the perfect way to cook the wild-caught Coho salmon available at my local market and promised to take me on a flavor journey that mirrored my life, back through the southwest and into the heart of Kentucky. It did not disappoint. In fact this recipe could not have been more satisfying. Each flavor in the sauce was uniquely displayed while blending into a smooth and lingering complexity. The dark sweetness of the honey and bright tart touch of lime held the smokiness of the bourbon and the heat of the chipotle in a delightfully suspended tension while balancing the wild flavor of the fish. Each bite was a revelation worth savoring. Served with a Lemon Rice Pilaf and Stir Fried Snow Peas or Corn Salad with Pecan Dressing it makes a light and impressive summer meal. Melt the butter in a large skillet. 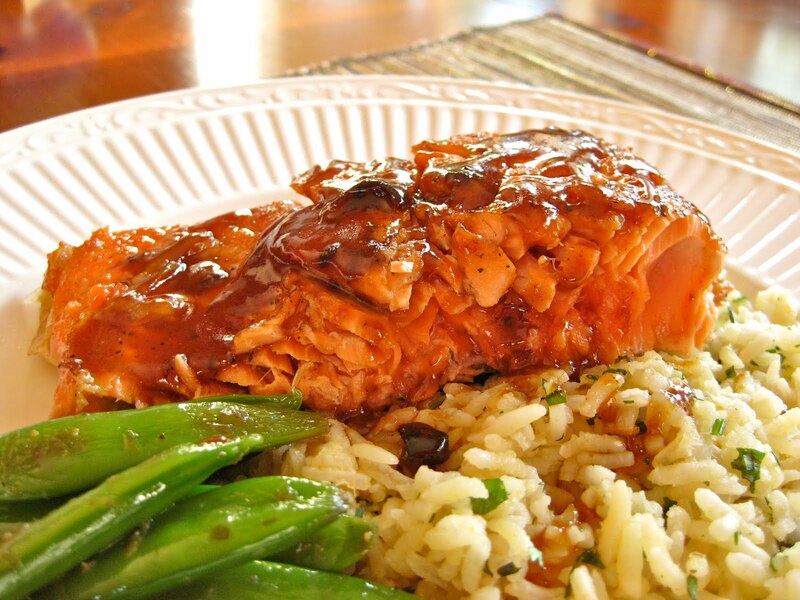 Place the salmon in the skillet, skin side up, and sear it for 1 to 2 minutes. 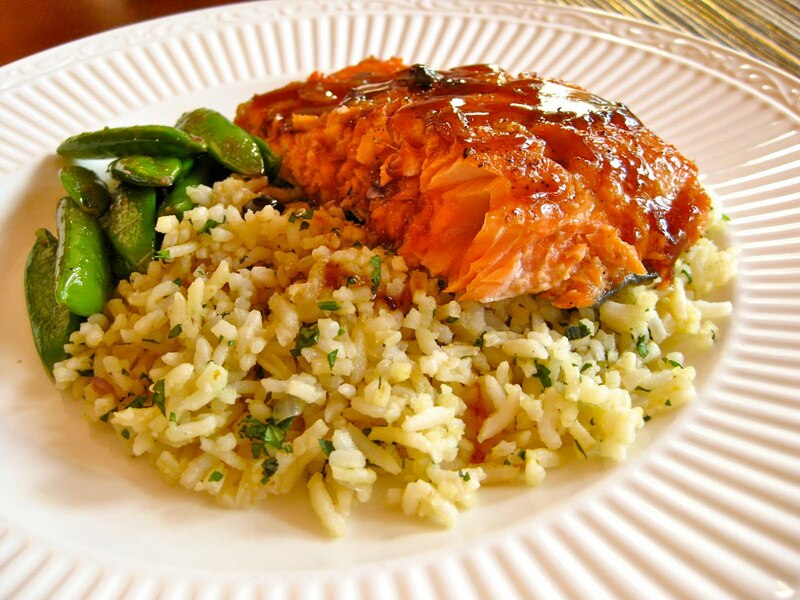 Remove the salmon from the skillet and set aside. Turn the burner down to low. Add the honey, bourbon, chili powder, and lime juice to the skillet. Whisk the ingredients together and continue heating the mixture until the glaze thickens slightly. Return the seared salmon fillets to the pan and cook the mixture for 3 to 5 more minutes, or until the salmon is light pink inside. Plate the salmon or remove it to a serving platter. Drizzle the glaze over the salmon fillets and garnish with candied lime zest. 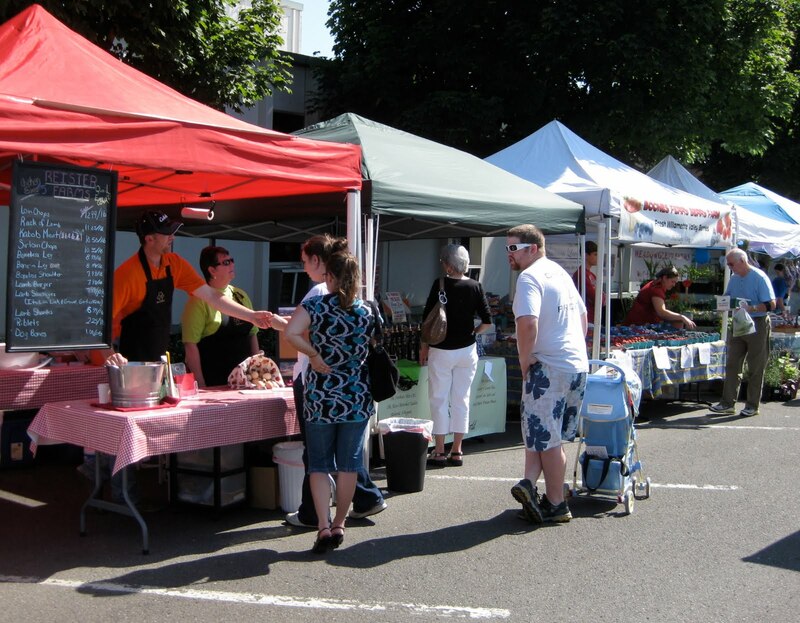 Summer is here and the produce market is once again full of a variety of fresh, luscious and local seasonal fruits. I have been gorging on local raspberries, taking note of apricots and peaches at the market and have even picked a few blueberries from my own bushes in the backyard. And then there are cherries, gorgeous sweet piles of them. Here's a great main dish salad that makes good use of of the abundant seasonal fruit we are now blessed with. This salad recipe makes quick work of figuring out what's for dinner while offering an interesting way to use leftover chicken. The result is a pleasing summer supper that is bright and fresh. This salad brings together some delightful contrasts. 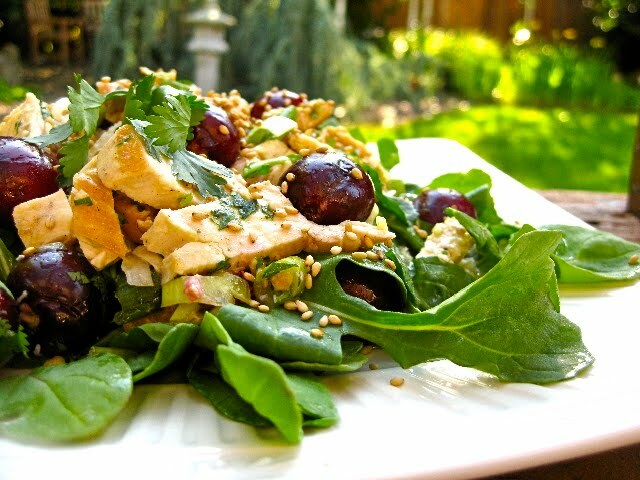 Cherries offer a luscious sweet counterpoint to the simple taste of chicken, the sharp flavor of the arugula, and the heat of the ginger. They also bring a bright color contrast to the pale creaminess of the chicken breasts and the fresh green of the arugula leaves. Serve it with a loaf of fresh crusty bread and a glass of rosé or sparkling water for a simple and refreshing summer meal. from "The Oregonian," adapted from "Good Food No Fuss"
Cut the chicken breasts into bite sized chunks. Mix the cherries with the chicken. Take some of the green pieces of sliced onions and soak them in ice water to use for a garnish, if desired. Add the rest of the sliced green onions to the chicken/cherry mixture. Set aside. Make the dressing: Whisk the lemon juice, mustard, ginger, ground coriander, salt and pepper in a small bowl until mixed. Gradually whisk in the olive oil. Taste and adjust the seasoning as needed. Toss the arugula with about a quarter of the dressing, Arrange the greens on four plates. Toss the chicken/cherry mixture with the cilantro and remaining dressing. Pile this mixture on the greens and sprinkle with sesame seeds. Drain the soaked green onion strips and scatter them on top. 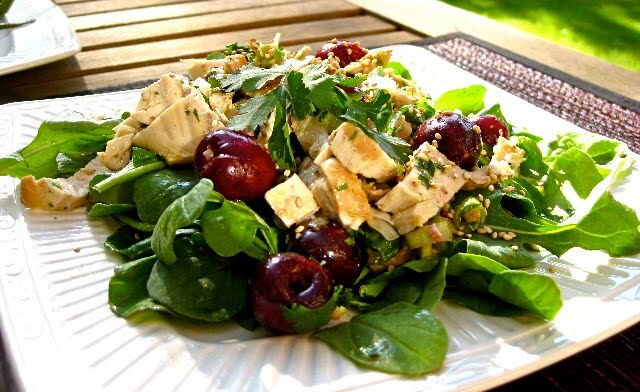 ~ Instead of using chicken breasts you cook yourself you could easily use a rotisserie chicken from the market to make this salad. ~ I love fresh dressings but if you are in a hurry try substituting a bottled light vinaigrette for the dressing here. You could still whisk the chopped fresh ginger into the vinaigrette before dressing the salad. ~ If you are feeling adventurous try substituting chopped toasted hazelnuts or walnuts for the sesame seeds and/or add bleu cheese crumbles or goat cheese on top. July 4th is a holiday that is steeped in nostalgia. The day commemorates the birth of our nation, the roots of our national independence, but also reminds us of our own roots, entwined with and fed by connections to our past. On the Fourth of July I remember summers from my childhood. I remember gathering with family on long lazy summer afternoons for picnics, conversation and some occasional fireworks. Those gatherings were sun soaked opportunities to catch up and renew bonds of family and friendship over ample meals of fried chicken or barbecue, summer salads, watermelon and tempting desserts. This cake is based on a bond of friendship. It is a family favorite, one I remember from my childhood. 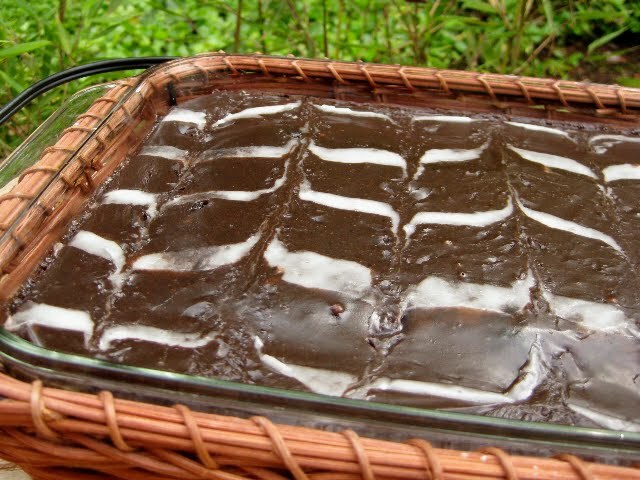 It has shown up at many a family picnic or potluck over the years. It is easy to make and easy to transport. 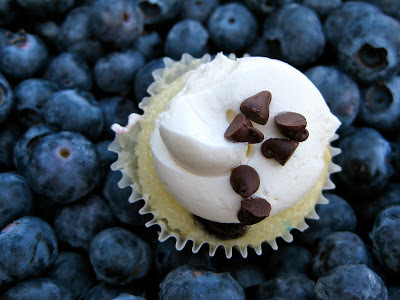 It is also a crowd pleaser, a basic recipe favored by children and adults alike. 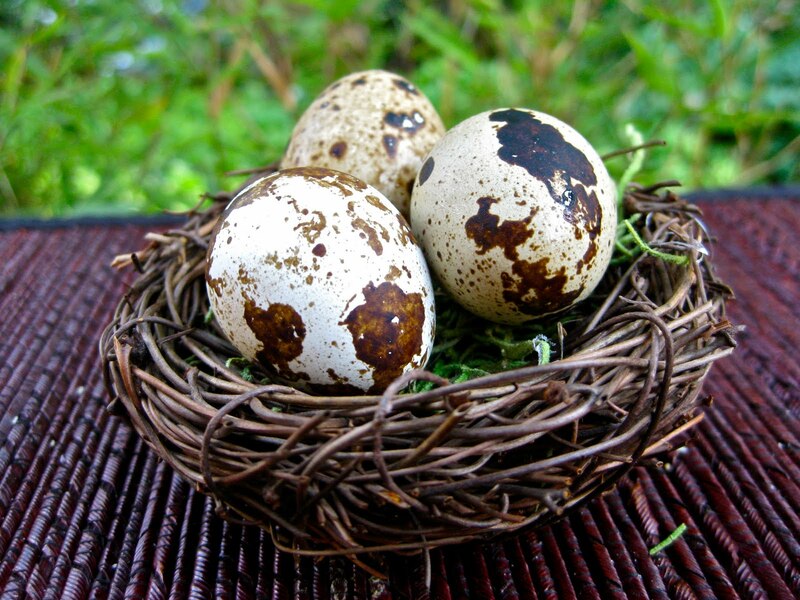 The original recipe was given to me by Aunt Hen. Aunt Hen got it from a friend she had known for many years. While the cake may or may not be her friend’s original creation she made it often and her name has been attached to this cake in the vernacular of my family for as long as I can remember. 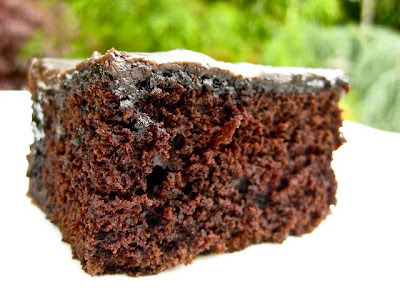 In my family a Bishop Chocolate Cake is a simple cake made with cocoa powder and covered with a fudgy chocolate frosting that is poured over the cake while it is hot. This cuts down on the number of steps involved and time spent in the kitchen. While the whole cake, fully frosted, rests to cool, the cook can attend to the rest of the meal or any other details that need to be accomplished before the cake is served. The original recipe was wonderfully simple and tasty but over the past forty years my tastes have grown to prefer recipes with less sugar as well as less fat where possible. I have also come to expect a richer infusion of cocoa. As a result I have updated the original recipe somewhat. It isn’t what I would call a particularly health conscious chocolate cake. There are recipes for those elsewhere, (a Midnight Chocolate Cake, for example.) Still I did cut a half cup of fat and half cup of sugar from the original while using some brown sugar in place of some of the white. I like the taste a little better and with that rich fudgy icing they really aren’t missed at all. Spray a 9 x 13 inch baking pan with cooking spray. Set aside. Dissolve soda in buttermilk. Set aside. In a medium mixing bowl, cream the butter. Add sugar, cocoa, salt, eggs, and vanilla. Add water and buttermilk alternately with flour ( Add ½ cup liquid, then 1 cup flour. Repeat and end with the liquid.) Beat well after each addition. 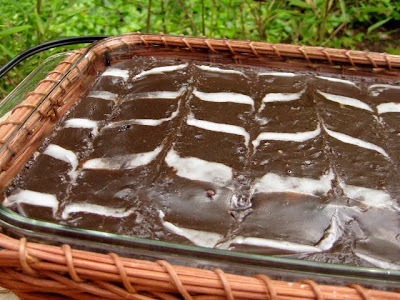 In a medium saucepan, combine the butter, milk and cocoa powder. Bring this mixture to a boil. Remove from heat and immediately add the confectioners’ sugar, whisking until smooth. Pour the hot frosting over the cake as soon as you remove the cake from oven. Let cake and frosting cool at the same time. Note: To add design mix 1 cup 10x sugar with 1½ Tablespoons of milk and a dash of vanilla. Whisk until smooth, then place in a small Ziploc sandwich bag. After pouring the chocolate frosting on top, quickly snip the end from a lower corner of the bag and pipe the white frosting in long thick lines across the top, end to end, about 2 inches apart. Set the bag aside and draw a knife through the top of the icing, first in one direction and then the other, a few inches apart. Honestly, this didn’t work as well as I hoped. I don’t know if I would do it again or not. If so I would make sure the chocolate frosting was hotter and I would have everything completely ready to go so I could work faster. I am on the road again. I have been traveling quite a bit lately. Along with the joys of travel comes a certain sense of being disconnected. I have so many ideas for posts in my head but getting them onto my blog has been slow going lately. Today, transferring planes in Chicago, rolling my bag underground and then along Concourse B, I saw something so exciting it made me wish I Twittered. If I did I would exclaim at the discovery of the Vosges Haut Chocolat storefront I was about to roll past on my way to Concourse F. Thankfully the first leg of my journey arrived in Chicago a good thirty minutes early leaving me some time to linger over the exotic collections of truffles offered there. I have frequented the Vosges website for years when in search of scintillating flavor combinations. 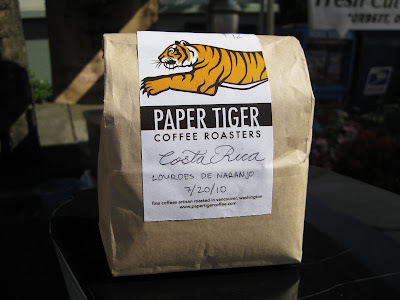 There I have enjoyed the pleasure of reading about their carefully chosen ingredients as well as their inspiring attention to detail and their ability to carry a theme to its ultimate conclusion. I have even tasted Vosges candy bars which are sold at Whole Foods. Still I had never before had the opportunity to actually taste any of their amazing truffles. It was serendipity, one of those unexpected and delightful thrills of travel to be such a huge fan and to be surprised by the opportunity to linger over, purchase and experience something that I have dreamed of and been inspired by for years. Because of the marvelous heat in this part of the country I was a little concerned about buying too many and letting them melt on the plane so I bought a small Exotic Truffle Collection, and hope to buy a larger collection on the way back to Portland.